In this Getresponse vs Mailchimp review, I examine two of the leading email marketing solutions in depth, to see which of these two well-known email marketing tools is best suited for your business’ requirements. You'll get a detailed overview of their pricing, key features and strengths and weaknesses. Let's start with a basic question: what do Getresponse and Mailchimp actually do? Getresponse and Mailchimp: what do they do? monitor statistics related to your email marketing — open rate, click through, forwards and more. We'll discuss these features in more depth later on in the review. But first, let's discuss something that's pretty integral to both Mailchimp and Getresponse: autoresponders. As part of this comparison review, I thought it might be worth spending a bit of time exploring something very important offered by both Getresponse and Mailchimp: autoresponder functionality. three weeks later they could receive an encouragement to follow you on Twitter and Facebook. The idea is that a lot of your email marketing gets automated – once you’ve set things up correctly, subscribers will automatically receive key messages from your business without you having to bother sending out e-newsletters manually (although you can still of course do this as and when required). Regardless of whether you plump for Getresponse or Mailchimp, it’s well worth investing some time in understanding what autoresponders are and using them effectively. When used correctly, they save a huge amount of time and have the potential to generate significant income. So what's the autoresponder functionality in Getresponse and Mailchimp like? Getresponse and Mailchimp both provide extensive autoresponder functionality — arguably some of the best in the business. Both products offer a similar set of autoresponder triggers to choose from — subscription to a list, opens, clicks, purchase made, URLs visited and user data changes all can be used to kickstart an autoresponder cycle. date / time - for example, you can send automatically send messages x days after sign up, or on birthdays. In short, both products are really strong when it comes to autoresponders. One thing worth a particular mention however is Getresponse's new 'marketing automation' feature, which allows you to create autoresponder cycles / user journeys based on flowcharts: very sophisticated stuff, which you can get a sense of from the video below. Mailchimp's workflows also allow you to create similar - and very sophisticated - user journeys but my hunch is that most people will find the new Getresponse interface better for designing 'bespoke' journeys, because it's a much more visual and flexible process (as the screenshot below highlights). Personally, I prefer the Getresponse automation workflow to Mailchimp's more template-driven approach. With Getresponse you can create bespoke user journeys that are completely tailored to your business processes, and the level of control you get is quite remarkable. There are several tiers of pricing plan with both Mailchimp and Getresponse, and within those, many sub-tiers, which makes both the products' pricing structures quite complicated. Obviously one very welcome feature of Mailchimp is its free plan – you can send up to 12,000 emails to up to 2000 subscribers per month. This is generous and will be useful for users who wish to send occasional emails to a relatively small list. However, emails sent using this plan display Mailchimp advertising on them, which makes them look slightly less professional in appearance. conversations (a way to view and respond to contacts' replies to your email campaigns from inside the Mailchimp interface). That said, the free plan is pretty generous, providing many of the features available on the entry level 'Grow' plan. A 'Pro' plan is required to access the advanced segmentation, comparative reports and multivariate testing features. Getresponse also offers a free plan — it's limited to 30 days, but it's fully functional (for lists smaller than 1000 subscribers in size). The key differences between the Getresponse tiers involve access to webinar and landing page functionality - neither of which are available on the 'Email' plan but are, to varying degrees of usefulness, included with all the other plans. I suspect most readers of this review will be interested in comparing the Mailchimp "Grow" plan against the Getresponse "Email" plan. These are the cheapest paid-for offerings from the two companies; and they offer a broadly similar feature set. When looking at these two plans, it's probably fair to say that in general, Getresponse comes out cheapest in terms of pricing. The comparative costs with Getresponse’s “Email” plan are $25, $45 and $65 respectively making Getresponse, on the basis of these examples, a cheaper product. (These plans all allow you to send an unlimited number of emails per month to subscribers). However, Mailchimp offers narrower pricing bands than Getresponse – for example, several Mailchimp pricing options are available for those with mailing lists of between 5000 and 5601 records. This gets a bit confusing but basically means that depending on your list size – and so long as the size remains fairly static - you may find yourself able to avail of a cheaper deal with Mailchimp (for example, a list with 5001 subscribers on it will be $10 cheaper to host with Mailchimp than with Getresponse). Additionally, if your list is less than 500 records in size, Mailchimp will let you get into e-marketing more cheaply - their very cheapest plan, which allows you to host up to 500 records, is $10 per month. The bottom line is that if you intend to pay monthly, it's a case of swings and roundabouts: depending on list size, sometimes Getresponse will be the cheaper option, sometimes Mailchimp. However, if you are prepared to pay upfront for your Getresponse account, there are some sizeable discounts available which may Getresponse a substantially cheaper option for you: paying upfront for a year entitles you to an 18% discount; paying upfront for two years results in a 30% discount. No such discounts are available for Mailchimp. Pricing, of course, is not the only factor you should be basing a Mailchimp vs Getresponse decision on. Let's take a look at features. Both Getresponse and Mailchimp offer a variety of email templates you can use ‘out of the box’. These are of a fairly similar quality. I would probably say that on balance I slightly prefer some of the aesthetics of the Mailchimp ones; but against that there are significantly more Getresponse templates available (there are 500+ Getresponse templates to choose from, versus Mailchimp's 80+). In any event, you can tweak most of the templates pretty easily with both systems (more on that below) meaning that if you are broadly happy with a design, you can whip it into shape. You don’t need to use one of the supplied templates though — you can use your own HTML code on both Getresponse and Mailchimp to design your own template. You can also buy additional templates for both platforms from a third-party supplier like Theme Forest. The user interfaces offered by Getresponse and Mailchimp are quite different – Mailchimp opts for a very minimalistic sort of approach, with lots of big fonts (on big spaces) being employed to present menus, stats and data; they also present a lot of functionality in ‘wizard’ or ‘to-do’ list format. It’s quite distinctive and some users will probably appreciate the ‘big and bold’ approach. Getresponse, by contrast, provides a user interface that is based more around traditional drop-down menus. Neither system is particularly hard to use – personally I marginally prefer the Getresponse interface because you don’t seem to have to scroll quite so much to get at particular features or data (all the big fonts employed by Mailchimp mean a lot of stuff is ‘below the fold’, particularly on laptops – it makes for a clean interface but one where screen ‘real estate’ is arguably not all that efficiently used). One thing I'm definitely not keen on is the positioning of the 'save' and 'next' buttons in Mailchimp - they're often at the very bottom of the screen or generally hard to locate, meaning that when you're working on an email or setting up a sequence of autoresponders, you occasionally find yourself scratching your head regarding how to save your work and proceed to the next step. There's no denying however that the Getresponse interface could do with some visual improvements — it looks a bit tired compared to the sleek minimalism of Mailchimp (and this is despite a recent overhaul of the Getresponse interface). Both back ends are in general fine though really – it’s a case of personal taste here. Both Getresponse and Mailchimp allow you to edit your templates using a ‘drag and drop’ style editor. These editors are fairly similar in concept, in that they allow you to lay images and text out in a manner that suits you without resorting to any HTML coding. Getresponse arguably offers a more immediately 'flexible' interface - once you've dragged a piece of content onto your e-newsletter, you can just click on it to edit it directly. However the Getresponse interface can be a bit buggy occasionally, and for my money Mailchimp’s is slightly better when it comes to the actual dragging and dropping – Getresponse’s is rather the fiddly side. It’s quite easy with Getresponse to put items in the wrong spot in your email. Fortunately, there’s an undo button! When it comes to formatting text, Mailchimp steals a bit of a march on Getresponse, because it allows you to make use of web fonts; Getresponse limits you to using 'web safe' fonts like Arial, Times New Roman etc. 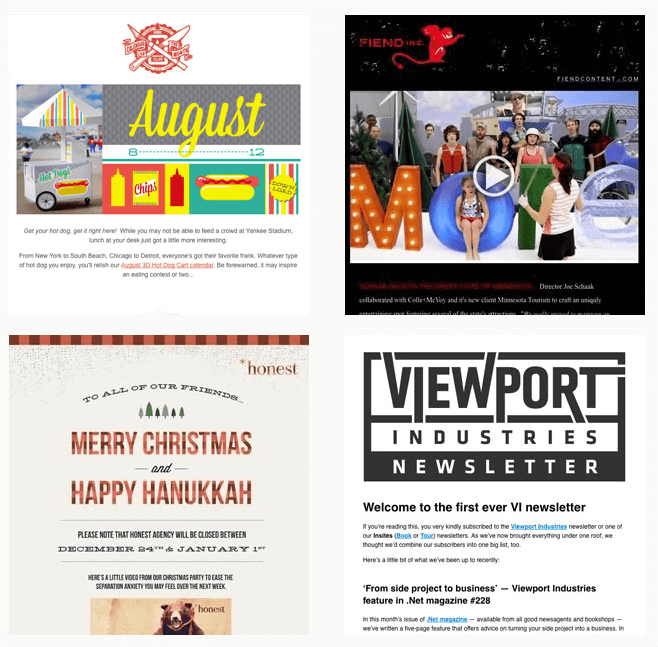 Web fonts have the potential to help make e-newsletter templates look considerably slicker than those using web safe fonts only. However, the selection of web fonts provided in Mailchimp is extremely limited — only a very small number of Google Fonts can be used, and really boring ones at that (they look so similar to web safe fonts that you might as well use the web safe ones!). If you really want to use web fonts in your emails, then Campaign Monitor's selection is better (the problem with Campaign Monitor however is that it is extremely expensive - see our Campaign Monitor review for details). Both Getresponse and Mailchimp let you create mobile-friendly versions of your HTML email, and a good thing too, as the proportion of people checking email on smartphones keeps growing. I prefer the way Getresponse handles previewing of mobile versions of your email. With Getresponse, as you create your email using the drag and drop editor, you see a preview of the smartphone version on the right hand side of the screen (i.e., in real time, as you make changes using the drag and drop editor). You can preview your smartphone email versions with Mailchimp too – but not in real time and it involves another click (again, this is probably a casualty of the big fonts / lots of space approach to interface design). Finally, Getresponse's mobile preview feature allows you to see how your email looks on a mobile device when the email is being viewed either in landscape or portrait - this is not the case with Mailchimp. Getresponse's drag and drop builder lets you see how your email looks on a smartphone, in real time, as you build it. There are two ways you can add subscribers to a mailing list: using a 'single opt-in' or a 'double opt-in' process. When you use a single opt-in process, the person completing your sign-up form is added to your mailing list immediately. With a double opt-in process, the person signing up to your list is sent an email containing a confirmation link that he/she must click before they are subscribed. The main benefit of a single opt-in process is that it makes it easy for users to subscribe; it also generally increases conversion rate and therefore the number of subscribers on your list. A double opt-in process is better for verifying that the people subscribing to your list are using real email addresses and leads to cleaner data and more accurate stats. Up until very recently, Mailchimp forced users to use the double opt-in method, which nudged a lot of users in the direction of other tools. But the good news for Mailchimp users is that both methods of opt in are now facilitated. This is not the case with all competing products, so a thumbs up to both Mailchimp and Getresponse here. An important feature of email marketing solutions is split-testing. This basically allows you to try out a variety of subject headers (and, depending on the tool in question, content) on some sample data (for example, 5% of your list) before rolling out the best performing subject header / email version to the list as a whole – where ‘best performing’ generally means the version of the email that generated the most opens or clickthroughs. It is a clear win here for Getresponse over Mailchimp: with Getresponse, you can test up to 5 different versions of your email, and try out a wide range of variables - content, subject line, 'from' field, time of day and day of week. This is the case regardless of which type of Getresponse plan you are on. By comparison, on its cheapest ('Grow') plans, Mailchimp only allows you to split-test three different versions of your email. If you are using relatively small lists, this is not such a big deal, because for statistical reasons split testing is only worth doing on relatively large lists — but anybody intending to do mailouts to big databases will definitely be better served by the split-testing functionality offered by Getresponse. To be fair, there are some more advanced split testing options available with Mailchimp - but you have to be on a 'Pro' plan to avail of them. This will set you back $199 per month on top of whatever it costs to host your mailing list with Mailchimp. If you can live with this sort of cost, you'll be able to split test 8 variants of your e-newsletters against each other. Both Getresponse and Mailchimp allow you to create data segments easily enough — you can use a variety of filters to identify subscribers based on particular criteria and save them. In Getresponse segments are called 'saved searches'; I'd prefer if they were called segments myself, as it can be a bit hard to remember, when sending out e-newsletters, where the segments live. However, Getresponse beats Mailchimp hands down when it comes to sending e-newsletters to your segments. This is because the basic version of Mailchimp only allows you to send e-newsletters to one segment at a time. For example, if you had a mailing list about guitars with three pre-existing segments in it, 'red guitar owners', 'blue guitar owners' and 'green guitar owners', and you wanted to send an e-newsletter to the red guitar and blue guitar owners in one go, you could do this in Getresponse really easily: you'd just tick the relevant segments and hit send. By contrast, in Mailchimp, to achieve the same thing you'd have to create a brand new segment containing red guitar owners OR blue owners. More work, and more segments cluttering up the place. Similarly, Mailchimp only allows you to send to one list at a time. Although it is definitely best practice to consolidate your data into one list and use fields to flag data types, there are nonetheless occasions where you may end up working with subscribers which are stored in multiple lists. In Getresponse you can send e-newsletters to multiple lists at once — this isn't possible in Mailchimp. Additionally, excluding segments is much easier in Getresponse - once you've picked your list of recipients, you can simply tick the segments or lists that you want to exclude from the mailout. If you want more advanced segmentation options, you can get these in Mailchimp - but you'll need to be on an expensive 'Pro' plan. (You can read more about the sort of segmentation options you can expect on a ‘Pro’ plan here). Getresponse's more flexible approach to both segmentation and list management is, in my view, one of the strongest reasons for using it over Mailchimp. Reporting on both Mailchimp and Getresponse is very comprehensive: you can track all the usual things like open rates, clickthroughs and unsubscribes, but you can also drill down into the data further – for example, you can look up somebody on your mailing list and get an overview of what lists they are on; their location; IP address; and what emails they’ve previously opened. This is all very useful data for understanding your audience and informing your future marketing strategy, if rather Orwellian. Its ‘member rating’ system (available on all plans), which automatically assigns a score out of five to each subscriber on your mailing list based on the number of times they’ve opened or engaged with your mailouts. This allows you to spot potentially good leads more easily. To be fair, Getresponse also offer a 'scoring' option, but this requires more a bit more user intervention to set up - you need to manually create marketing automation rules to assign the scores (the plus side of this is that it is considerably more flexible and, used carefully, sophisticated). Its ‘conversation tracking’ (paid plans only), which allows you to manage and store any replies to your campaigns within Mailchimp. This is very useful, particularly if your business is one which typically has regular email contact with leads and clients, and almost brings Mailchimp into ‘CRM’ territory. Getresponse’s reporting system has an excellent feature which is not present in Mailchimp however: its automatic creation of emailable ‘groups’ — based on user action — after a mailout is sent. After an email broadcast, Getresponse will show you several segments of contacts who took specific actions – you’ll see groups of people who opened your email, did not open your email, clicked your email but did not meet a goal etc. – and you can mail them all again really easily. This is extremely useful for sending quick reminders or follow-up offers to relevant contacts. Mailchimp does let you see this information too — but in order to create segments from it you'd need to export and reimport the data, using new flag fields to manually create your segments. This is unnecessarily fiddly — and, as discussed earlier, you'll quite possibly run into some headaches with emailing these segments, because Mailchimp is so restrictive in this area. Both Getresponse and Mailchimp integrate with a wide range of other services – you will need to check their relevant websites for an exhaustive list, but services like Paypal, BigCommerce, Facebook and Magento are examples of the kind of services catered for. I have found in general that Mailchimp tends to be more of a ‘default’ option than Getresponse for many services (Squarespace and Shopify being obvious examples, along with Facebook), and Getresponse seems to rely quite a lot on a third party tool, Zapier, for quite a lot of its integrations (which may make them a bit longer to set up). That said a lot of the ‘big’ services are catered for perfectly well with Getresponse; if you like the tool and want to integrate it with an established service like Paypal or Facebook, you won’t have any difficulty doing so. Additionally, an ‘integration’ often means simply adding a sign-up form to a website, and both Getresponse and Mailchimp make it very straightforward to do that (see below for more information on sign up forms). But there are times — particularly with services like Squarespace and Shopify — where integrating a mailing list sign up form into your website is a bit easier if you're a Mailchimp user. It's worth drawing particular attention to the way that Facebook ads and Mailchimp work together - as its an area where using Mailchimp can be more beneficial (or at least easier). You can connect your Mailchimp account to Facebook, which will then — in its trademark big-brother way — examine the email addresses on your list and show ads to anybody on your database with a Facebook account (this is called a 'custom audience'). When you've connected your accounts, Mailchimp list is also synced with your Facebook account, meaning that Facebook will automatically start showing the ads to any new subscribers (i.e., in addition to the people who were on your list when you connected your accounts). Now, you can do this with a Getresponse list too, but you will have to upload your list manually periodically to ensure that new subscribers get to see your ads. On top of this, you can actually run Facebook ad campaigns (and for that matter Google ad campaigns) from within your Mailchimp account, so if you're the kind of person who wants to manage everything in one place, you may find this functionality handy. Both Getresponse and Mailchimp allow you to design sign-up forms and grab a snippet of code which then you can then embed on your site to embed the form. With Getresponse, the design options are a bit more extensive, and you can also choose from a range of pre-designed form templates (some good, some cheesy). Mailchimp is better at the forms business however where mobile versions of forms are concerned, automatically creating a more discreet banner version of a pop-up form when it is viewed on a mobile device. This can be beneficial from an SEO perspective - Google's search algorithm is not a fan of intrusive 'interstital' forms. I have spoken to Getresponse's support team about this issue and they have said that better mobile forms are on the way (I don't have any timescales to share yet on this however). In the meantime — as a Getresponse user myself — I'm using Sumo to get around this issue. Mailchimp also provide some iPad / Android forms you can use for capturing data via tablets at events, something which used to be available with Getresponse but unfortunately seems to have been discontinued. A landing page creator allows you to make use of various templates and a drag and drop editor to create a 'squeeze page' which improves the sign-up rate to your list. These are distraction-free sign-up pages that are exclusively designed to improve conversion rates. Ideally, A/B testing is used to test different versions of your landing pages, with the best-performing ones being used automatically to maximise the number of sign-ups. Up until recently, landing pages were not included with Mailchimp plans, making Getresponse a more attractive option for users wanting to capture email addresses off the back of online advertising campaigns. If you wanted to use landing pages with Mailchimp, you to either code something yourself or make use of a tool like Instapage or Unbounce (the fees for which are quite high). The good news for Mailchimp users is that landing page-building functionality is now provided on all Mailchimp plans. However, as things stand, this functionality is very limited: no A/B testing is provided, and only a few templates are available (Getresponse provide hundreds). Every Getresponse plan makes the landing page creator available to users, allowing users to choose from an extremely large selection of landing pages — but only the more expensive 'Pro', 'Max' and 'Enterprise' plans come with the fully-featured version of it. On the cheapest 'Email' plan you can only create one landing page - and this can only be viewed by users 1000 times per month. The 'Email' plan's version of the landing page creator also disables A/B testing (which is probably the most useful aspect of landing pages in general). If you are keen to use Getresponse's landing page creator it therefore makes sense to invest in one of the more professional plans. (For the record, an add-on version of the landing page creator is available to 'Email plan users' for $15 per month - it unlocks the number of views but doesn't provide A/B testing...rendering it a bit pointless in my view). To sum up: as things stand, Getresponse offers a better landing page creator, so long as you are on a 'Pro' plan or higher. For users wishing to provide versions of their confirmation emails and thank-you pages in different langauges, Mailchimp is a better bet than Getresponse, as it provides this functionality. This a bit on the fiddly side however, and generally relies on the language of the web browser being used to display content in a local language, rather than sending users to a particular URL based on the version of the website they are signing up on. With Getresponse 'Pro' plans and up, you get something that is not included in Mailchimp's feature set at all: the ability to host webinars. Webinars are commonly used as a way to generate business leads, with businesses offering access to webinar content in exchange for an email address. Normally this involves using two apps - one for hosting the webinars, and one for hosting (and broadcasting e-newsletters to) a mailing list. Getresponse have been quite clever here by offering webinars as part of their e-marketing offering. I have not tested the webinar functionality, and I suspect that it is of more of a 'cut down' nature than a dedicated webinar app like Gotowebinar - but nonetheless, the integration of webinar hosting and e-mail marketing services into one package should serve many users perfectly well and will be more cost-effective than using two separate apps. One thing to watch out for is the attendee cap: Getresponse limits this to 100 people on its 'Pro' plan and 500 on its 'Max' plan (it's not clear what the limit for Enterprise plans is - I suspect it's negotiable). Webinars are not available as standard on the cheapest Getresponse offering (its 'Email' plan), but you can pay another $40 or $99 per month to enable this functionality and allow 100 or 500 attendees respectively to tune in. Getresponse now offer a CRM tool on their 'Pro' plans and up. This is something rather unique to email marketing tools — Mailchimp doesn't offer this, nor do competitors like Campaign Monitor, iContact or Mad Mimi. and based on the action they took with regard to that email (clicking on a certain link etc) you could automatically move them onto another stage of the pipeline. It's really clever stuff and as things stand, there is nothing really comparable in Mailchimp to it. There’s no email activity tracking - i.e., if you send a contact an email manually (i.e., outside the Getresponse interface), there’s no way to track this automatically (you have to manually add a note to a contact’s file). There’s no task management functionality. Adding contacts to a pipeline stage is difficult. You have to add contacts to a list first, then go to the CRM pipeline, add a deal and search your lists for the contact you just added. To be fair to Getresponse, the CRM functionality is a relatively new feature. It does provide some interesting features which some businesses will find useful — but improvements to it do need to be made, and hopefully Getresponse will flesh out this tool so that it becomes a more fully-specced CRM option in future. Finally, there's support to consider. Getresponse used to be a clear winner in this department, because phone, live chat and email support were offered, whereas Mailchimp only offered email or live chat support. Getresponse recently axed their phone support, meaning that both products now provide a similar level of support. If phone support is a deal-breaker for you, you might want to take a look at Aweber - one of the few email marketing products which still includes it. (For more details, please see our Aweber review). Both Getresponse and Mailchimp are feature-packed tools which will meet the needs of most businesses wishing to use email as a marketing channel. However, I ultimately come down on the Getresponse side of the fence, and that’s why we chose it for Style Factory’s email communications. Getresponse is MUCH better for working with segments and multiple lists. On the basic version of Mailchimp, you can't send to multiple segments or lists (or exclude them from your mailouts). To get more flexible segmentation option in Mailchimp, you have to pay an extra $199, which will make it prohibitively expensive for a lot of small businesses. I prefer the way that email automation works in Getresponse — the flowchart approach is more intuitive, and the integration between the CRM functionality and automation features can be very handy in certain contexts. Getresponse is generally bit cheaper than Mailchimp (considerably so if you pay upfront for one or two years of service). You get more bang for your buck — CRM, landing pages with A/B testing and webinars are all available with Getresponse; this is not the case with Mailchimp. The strongest argument for using Mailchimp is its free plan: it is admittedly very generous for anyone with a small list. It's also worth considering Mailchimp you're using a web application that is designed to integrate easily with it. Power users of Facebook ads will also appreciate how easy it is to create custom audiences with Mailchimp. Here is a more complete rundown of reasons why you might want to use one of these tools over the other. Emailing and excluding multiple segments and multiple lists is very easy in Getresponse - but not really doable in the standard version of Mailchimp. Webinars: you can host them with Getresponse; with Mailchimp you'll need to use another application. Depending on your list size, and whether or not it is likely to grow, using Getresponse will usually work out cheaper than Mailchimp (particularly for larger lists or if you pay in advance for one or two years of service). Getresponse offers considerably more email templates than Mailchimp. The Getresponse split-testing functionality that is provided on the cheapest plan is considerably better than that offered on the equivalent entry-level Mailchimp plan. Getresponse's landing pages facilitate A/B testing; Mailchimp's currently do not. Hundreds of templates are available for Getresponse's landing pages; Mailchimp only offers a few. Getresponse's Marketing Automation interface makes it easier to create tailored user-journeys. You get some functionality CRM built in (on 'Pro' plans and up), which integrates pretty neatly with Getresponse's email automation features. Generous discounts are available for Getresponse if you pay upfront for a year or more's service. You can try Getresponse for free here. Its free plan is very generous, allowing you access to many key features (including autoresponders) and to send 12,000 emails per month to up to 2,000 subscribers. It has more pricing bands than Getresponse, which may make it cheaper for some users (particularly those whose mailing list size is likely to remain very static). Mailchimp generally integrates better with a wider range of third-party tools and services. It’s easier to work with Facebook Ads using Mailchimp. You can use web fonts out of the box in Mailchimp (note however that the selection is limited to a few very boring fonts!). Its ‘member rating’ system is potentially useful in identifying key leads / customers. If your list is very small (i.e., contains less than 500 records), you can start sending e-newsletters more cheaply with Mailchimp. Some users will appreciate the modern, minimal interface — which is less buggy than the Getresponse one. You can try Mailchimp for free here. Have you got something to say about Getresponse or Mailchimp, or have you any further queries about these products? Share your thoughts or questions by leaving a comment below (note: if you're reading this article on a mobile phone, you may be viewing a faster loading AMP version which doesn't feature the comments. You can access the full version of this post, which includes comments, here). You might also find our guide on how to create a newsletter and AppInstitute's guide to email marketing helpful.